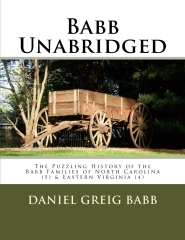 Book Announcement: Vol 7: The Puzzling History of the Babb Families of North Carolina (5) and Eastern Virginia (4) Now available in Print! Imagine, a friend loans you their lake house for the weekend, while they are traveling out of the country. You show up ready to spend some great leisure time out on the lake. But shortly after you arrive, a massive storm sets in and lingers for the next several days. As you stand inside, watching the rain pour down, you begin a search for something to do. The only thing you come across is an opened box that contains a Jig-Saw puzzle. The lid is missing, so you have no grasp of what picture will finally appear when it is assembled. You also don’t know how many pieces there should be, or if they are all there. Even worse, you consider that this might be two different puzzles that have had the pieces co-mingled. Despite your feeling of dread you begin the assembly process anyway. This is essentially what members of the Babb families of North Carolina have to do when assembling their family tree. The various branches present one of the biggest unsolved mysteries of our collective family tree. Remaining records are scarce, many are missing, some could be from other trees and several pieces look identical. There are more missing links than can easily be discussed. We see a large number of branches with no trunk to connect them. In spite of these obstacles, a single document sheds light on a connection between the two trees and I work toward uniting them and finding a path back to England.